Je huid gaaf en gezond. 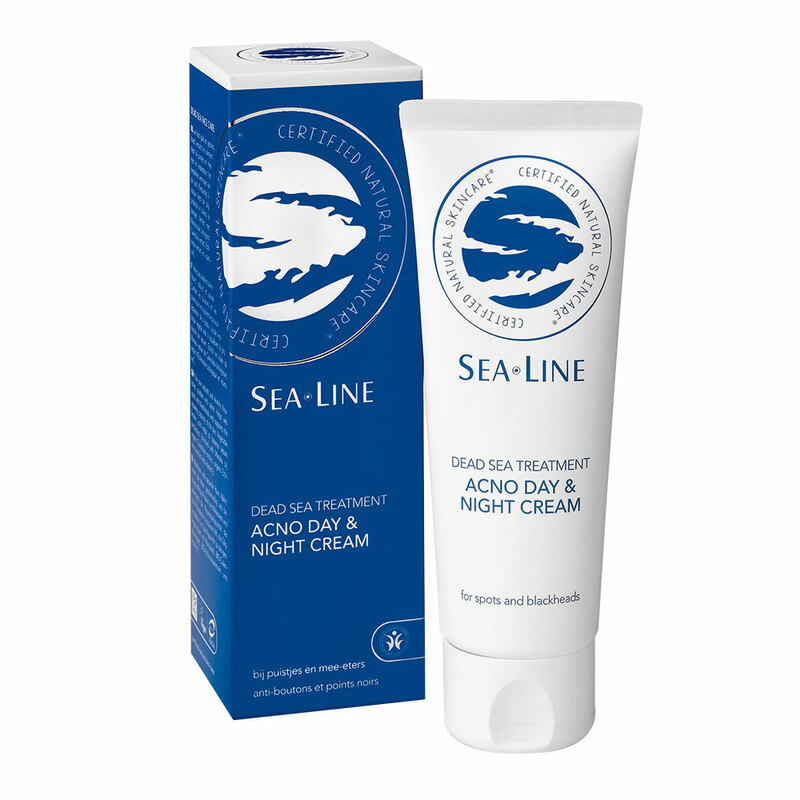 Acno Day & Night Cream voedt, verzacht en kalmeert. Helpt bij puistjes en mee-eters en ondersteunt het herstellend vermogen van de huid. Plantaardig linolzuur helpt de talgproductie in balans te brengen. Verrijkt met Manuka olie, biologisch Calendula extract, Echinacea extract en vitamine E.
’s morgens en ’s avonds de crème op de huid aanbrengen na reiniging met Sea Line Mineral Face Wash.
Aqua (Water), Macadamia Integrifolia Seed Oil**, Cetearyl Alcohol, Glyceryl Stearate, Glycerin, Butyrospermum Parkii (Shea) Butter**, Simmondsia Chinensis Seed Oil**, Cetyl Palmitate, Alcohol, Sodium Cetearyl Sulfate, Helianthus Annuus Seed Oil**, Cocos Nucifera Oil**, Prunus Amygdalus Dulcis Oil**, Fragrance Natural (Parfum), Levulinic Acid, P-Anisic Acid, Echinacea Purpurea Extract**, Sodium Levulinate, Lavandula Angustifolia Oil, Ascorbyl Palmitate, Leptospermum Scoparium Branch/ Leaf Oil, Tocopherol, Dead Sea Salt, Hippophae Rhamnoides Fruit Oil, Phytic Acid, Equisetum Arvense Leaf Extract**, Arctium Lappa Root Extract**, Calendula Officinalis Flower Extract**, Disodium Cocoyl Glutamate, Origanum Majorana Leaf Oil, Plantago Major Leaf Extract**, Sodium Cocoyl Glutamate, Salix Alba Bark Extract**, Melaleuca Alternifolia Leaf Oil, Juniperus Communis Fruit Oil, Juniperus Mexicana Oil, Origanum Vulgare Oil, Commiphora Myrrha Oil, Cupressus Sempervirens Oil, Ormenis Multicaulis Flower Oil, Citrus Aurantium Dulcis Peel Oil, Canarium Luzonicum Gum Nonvolatiles, Cinnamomum Cassia Leaf Oil, Lavandula Hybrida Grosso Herb Oil, Lactic Acid, Benzyl Benzoate*, Cinnamal*, Citral*, Citronellol*, Geraniol*, Limonene*, Linalool.